By Miriam Valverde on Tuesday, July 26th, 2016 at 11:53 a.m. The boldest promise of Donald Trump’s presidential campaign was also one of his first. "I would build a great wall, and nobody builds walls better than me, believe me, and I’ll build them very inexpensively," Trump said, announcing his candidacy on June 16, 2015. "I will build a great, great wall on our southern border. And I will have Mexico pay for that wall." The big question, now that Trump is the Republican nominee, is how he would do it if elected president. At the Democratic National Convention, Sen. Elizabeth Warren derided the wall promise, saying it’s never going to happen. PolitiFact examined the logistics of Trump’s signature promise, interviewing immigration experts about the specifics of his proposal and possible challenges. We reached out to Trump’s campaign for more information on his plans for the wall, including expected total costs and timeframe, but did not hear back. Trump has said the wall could cost $8 billion to $12 billion, be made of precast concrete, and rise 35 to 40 feet, or 50 feet, or higher. He’s said the wall doesn’t need to run the nearly 2,000 miles of the border, but half of that because of natural barriers. 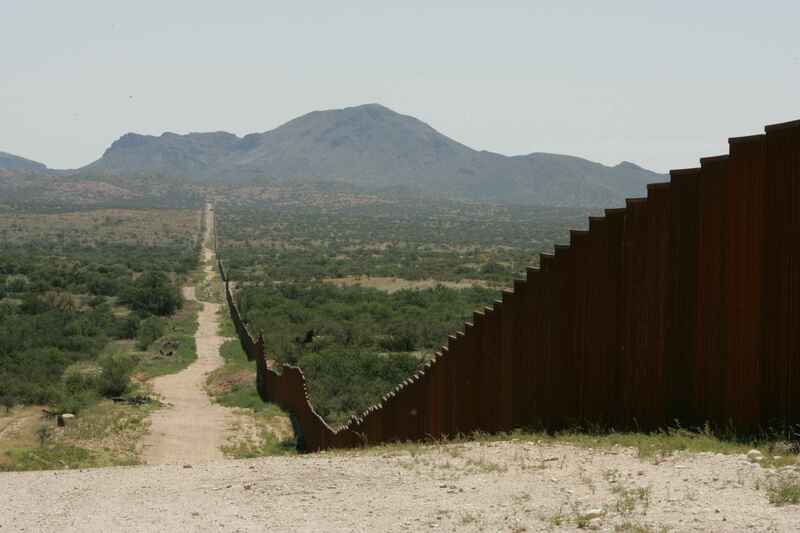 The U.S.-Mexico border stretches nearly 2,000 miles, more than half of it along the Colorado River and Rio Grande. As of May 2015, there was about 650 miles of vehicle and pedestrian fencing, according to a 2016 report from the U.S. Government Accountability Office. There is no hard estimate for how much it would cost to add fencing to the remaining portion of the border, but media estimates have placed it between $5.1 billion to $25 billion. Obviously, the high end is far more than Trump expects to get out of Mexico. The American Immigration Council, a pro-immigrant think tank, argues Trump’s plan would negatively impact the U.S. economy, affecting tourists, workers, students and business owners who cross the border daily. On the other side of the immigration debate is Mark Krikorian, executive director for Center for Immigration Studies, a think tank favoring low immigration. He supports more border fencing but sees challenges in Trump’s plan. One issue: Land along the Texas side of the border belongs to private citizens who may put up a fight if they feel they’re not getting enough money from the government for their property. Then there’s the issue of what form the wall would take. A concrete wall, for instance, would not allow border patrol agents to see immigrants who are trying to cross illegally, Krikorian said. Let’s assume, though, that everything falls into place. How would Trump make Mexico cough up construction money? Basically, by putting pressure on people who work in the United States but send money back home to Mexico. The plan outlined on Trump’s campaign website invokes Section 326 of the Patriot Act, which presses financial institutions to verify the identity of customers who seek to open accounts. Trump says he would introduce a "proposed rule" amending a code of federal financial regulation to include money transfer companies in the definition of financial institutions. He would also redefine "account" to include wire transfers. The desired result: No immigrant would be able to send money outside the United States unless they show documentation proving their legal status. Trump says Mexico receives an estimated $24 billion a year in remittances from people in the United States, and that the majority comes from undocumented immigrants. While the $24 billion amount adds up, experts have said it’s hard to tell how much of it is sent by undocumented immigrants. Trump’s conclusion is that Mexico will protest U.S. attempts to bar undocumented immigrants from sending money to Mexico. He says his proposed rule modifying definitions of financial institutions and accounts would not go into effect if Mexico makes that one-time payment of $5 billion to $10 billion, which would go for border security. Mexican President Enrique Peña Nieto has explicitly said there’s "no way" his country would pay for the wall. In a July 10 interview, Peña Nieto told CNN’s Fareed Zakaria that U.S. security is linked with the security of its neighboring countries. "We have a relationship of coordination, of collaboration and of cooperation in the area of security, precisely in order to have security in Mexico, to have security in the U.S.," Peña Nieto said. Even if Trump wanted to impose remittance regulations, immigrants might find ways around it, said Nestor Rodriguez, a University of Texas at Austin sociology professor who has been researching immigrant communities in the United States for decades. Someone else with legal status may send the money to Mexico on behalf of the undocumented immigrant, or send money in cash with people traveling. Trump said on his campaign website that he would generate money for the wall by increasing fees for visas and border crossing cards and by enforcing trade tariffs. Experts have told us there isn’t a connection between the U.S.-Mexico trade deficit (about $50 billion) and finding money for a wall. The Republican candidate’s plan for secure borders follows efforts by recent administrations to strengthen fencing along the U.S.-Mexico border. In 2006, President George W. Bush signed the Secure Fence Act, authorizing the construction of hundreds of miles of additional fencing at the U.S.-Mexico border, the use of more vehicle barriers, checkpoints and advanced technology to protect the border. In 2009, the U.S. Government Accountability Office pegged pedestrian fencing costs at $400,000-$15.1 million per mile, averaging $3.9 million per mile. Vehicle fencing — barriers set in remote areas to prevent vehicles from crossing the border— ranged from $200,000 to $1.8 million per mile, the office reported. Topography, type of fencing and materials used, land acquisitions and labor costs all impact cost per mile. "We sent a man to the moon," Krikorian said of securing the border. "I’m not saying we can’t do it, but it’s involved, difficult and expensive."